In a gaming galaxy far far away there was once an arcade title called Double Dragon that had two friends chasing their girlfriends through a plethora of thugs and lowlifes. The game was simplicity at its best that allowed the gamer to use a variety of martial arts and weapons to rescue their loved ones. Since then the fighting genre has been inundated with Tekken style fighters (not that this is a bad thing) but the market has become a little stagnant. 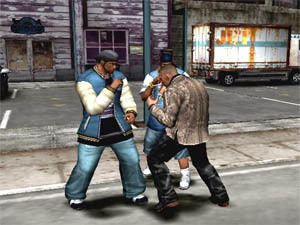 Fortunately for gamers, Namco have decided to up the ante with Urban Reign that transforms players into old school brawlers. Gamers are transformed into Brad Hawk, a hardened street fighter that must use his skills to clean up the streets from a variety of dangerous crime bosses. Fortunately for Hawk, he is accompanied by a variety of other street fighters who also agree with his cause and together it's time to clean up the streets once and for all. 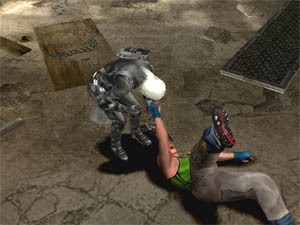 The gameplay of Urban Reign throws the player in 3D environment where they must use all their fighting skills and weapons (e.g. swords, planks, shovels and knives). The fighting contains all the moves one would expect in a fighting game from kicking, punches, throws and holds. By mixing and matching (e.g. the Circle or the Square button and the analog stick), players can spice up their manuevers. There is also some special moves in the game that get better and better as you continue through the game and you are awarded points at the end of each level to improve your character. Apart from the standard storyline mode, there is a variety of other modes from versus, destruction and team modes. 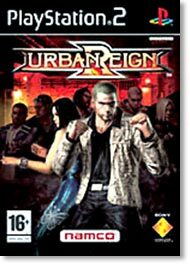 Graphically, Urban Reign looks a little dated on the PlayStation 2 (especially in multiplayer mode where the view is distanced to show more of the screen), however in single player mode, all the characters are well designed and cotain some impressive texture details. There are some special effects, such as super moves and lighting but nothing in the ball park of Industrial Light & Magic. Musically, Urban Reign contains a hard rock soundtrack that suits the genre perfectly and match that with a wide gamut of sound effects from bones breaking, swords hitting people and people getting thrown and you have a very decent sounding game. In conclusion, Urban Reign is a breath of fresh air but unfortunately becomes a little too repetitive as do the graphics of this title. Probably worth a rent before a buy with the average gamer finishing this title in around 10 - 15 hours. Good old fashioned old school fighting.